Let it be known that I’ve now gone a step further than shaved legs and carbon-fiber shoe soles. 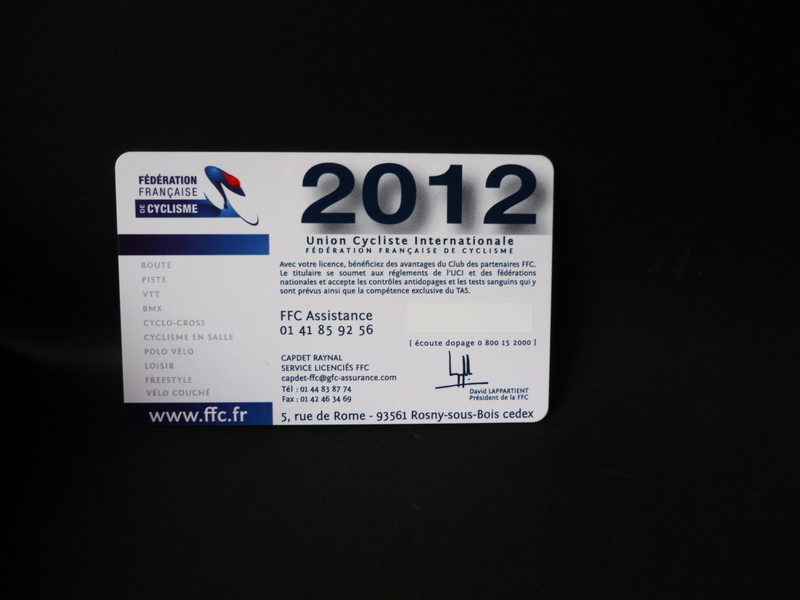 I am now a licensee of the Fédération Française de Cyclisme. I can enter any sportive race in the country with just a medical certificate, but the license adds a bit of legitimacy and integration I thought, and I get discounts on entrance fees to boot. I didn’t know I could do this, but I ended up being able to get the license without joining a club – something I really have little interest in right now. I wonder what will be next in this journey…? The next step? Winning a race? I like your thinking. I might ‘mistakenly’ pull it out instead of my debit card at the supermarket and see what kind of reactions I get. Don’t be. All you need is 35 Euros and one could be yours, too! What a minute – there is such a thing as carbon fiber shoe soles? What a wonderful world in which we live. Congratulations on the license. I agree with Tootlepedal – keep it prominently displayed always! Yes, I have them drying on the heater as we speak. if you look I think you’ll find just about anything you want in carbon fiber in your bike shop these days. What about club racing? Is there a race license? In Australia, Cycling Australia (who look suspiciously like robber barons) charge the very low priced rate of AU$300 (just about) for 12 months of elite racing license. Yes, they have different prices for different categories, so Juniors are 72 Euros and Cat 1 is 175. A little less ‘robberish’ here, it seems. Are races themselves expensive there, too?